Pakistan-based al Qaeda is secretly setting up sleeper cells and a clandestine network of jihadists to destabilize and take over Libya while hiding under a new cover name to prevent exposure and attacks, according to an internal Pentagon report obtained by the Washington Free Beacon. "Al Qaeda has established a core network in Libya, but it remains clandestine and refrains from using the al Qaeda name," according to the report produced jointly by the Library of Congress and the Combating Terrorism Technical Support Office’s Irregular Warfare Support Program, a unit under the assistant defense secretary for special operations. The report concludes that al Qaeda poses "a significant threat to the state-building process in Libya." The 54-page unclassified report describes al Qaeda—which President Barack Obama recently declared to be in decline—as "seeking to create an al Qaeda clandestine network in Libya that could be activated in the future to destabilize the government and/or to offer logistical support to al Qaeda’s activities in North Africa and the Sahel"—the Sahara desert region stretching across northern Africa. The report is dated August 2012 and was published before the Sept. 11 terrorist attack on the U.S. consulate in Benghazi that killed U.S. Ambassador to Libya Christopher Stevens and three other Americans. Intelligence officials have said since shortly after it occurred that the assault appeared to have been an al Qaeda attack. The Obama administration is currently under fire from Congress for initially claiming the Benghazi attack was the result of a spontaneous uprising by Muslims angry over an Internet video. Several U.S. intelligence officials said the Obama administration sought to hide intelligence that exposed the al Qaeda links to the Benghazi attack because doing so undermined Obama’s statement at the Democratic National Convention that al Qaeda was on "the path to defeat." Intelligence reports related to the attack showed that the al Qaeda front Ansar al-Sharia discussed the Benghazi attack with al Qaeda operatives outside Libya, which the Daily Beast reported on Sept. 28. The FBI currently is investigating the consulate attack. The Pentagon report, based on public sources, said al Qaeda has formed "sleeper cells" of terrorists around Libya that are likely part of an underground network providing weapons and training to jihadists. "Postrevolutionary Libya is a militarized society where young self-proclaimed jihadists are on the loose, ready to follow anyone offering a meaningful purpose for their newly acquired combat skills," the report said. "Al Qaeda’s clandestine network is likely attempting to attract these self-proclaimed jihadists through a mix of ideology, intimidation, and financial incentive." "Al Qaeda militants are using the countries that toppled their leaders in the ‘Arab Awakening’ as bases to train radical Western youths for potential attacks," the report said, adding that a small number of British jihadists are moving to Arab countries to seek training. Throughout Libya, al Qaeda is using a "secret and cautious approach" to avoid local and international scrutiny. However, there are indications al Qaeda infiltrated "dozens" of mosques and prayer halls in Libya in the aftermath of the 2011 revolution. Covert al Qaeda operatives in Libya also appear to be engaged in a campaign of assassinations against former officials and others from the Muammar Qaddafi regime as part of efforts to destabilize the new government in Tripoli. The report also said al Qaeda’s network is heavily armed due to the wide availability of weapons in Libya following the collapse of the Qaddafi regime. "The al Qaeda clandestine network has certainly stocked enough arms and ammunition to allow it to operate independently, given the wide availability of weapons in Libya," the report said. 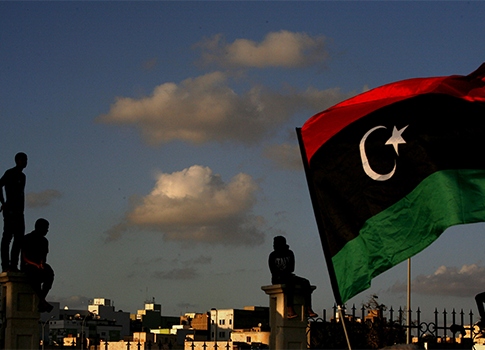 Recent efforts by the Libyan government to try and disarm militias and other groups have thus far been unsuccessful. As a result, the country will face continued violence, the report said. Funding for the al Qaeda network in Libya is believed to be originating from central leaders in Pakistan, who the report said are funded by "financiers, or regular charity donors in the wealthy [Persian] Gulf states." One tactic being used, according to the report, is infiltrating Libyan militias. The goal is "destabilize the central government and intimidate local communities." Strategically, al Qaeda’s goal in the country is to set up a "caliphate, instituting sharia, and ending the Western presence in Muslim lands," the report said. "Al-Qaeda’s primary goal in Libya is to establish an Islamic emirate as part of its overall objective to reestablish the caliphate." In Libya, the group Ansar al-Sharia, led by former Guantanamo prison inmate Sufyan Ben Qhumu, is the key al Qaeda presence, and is using social media to propagandize the al Qaeda message, including "extremist discourse, and hatred of the West, especially the United States," the report said. The report states that al Qaeda in Tunisia and Yemen are using Ansar al-Sharia as a cover name and that the groups are probably communicating with its namesake in Libya. Last week, the State Department designated Ansar al-Sharia in Yemen as an al Qaeda front. According to the report, French and Algerian security services identified 21 Algerians and five French nationals of North African descent as al Qaeda fighters in Syria. Those terrorists were trained in Libya before traveling to Turkey with false Libyan passports and crossing from Turkey into Syria. Two al Qaeda training camps are reportedly operating in Libya, one near Houn in the center of the country and the other near Sahl ‘Ajiha, in eastern Libya. "These facilities are designed to train volunteers for jihad from the Maghreb, Egypt, and Europe (Europeans of North African descent)," the report said. Darnah, Libya, known as a former redoubt of Islamist terrorists in the past, is also emerging as a new training and organization location for militants, the report said. During the 2011 revolution that ousted Libyan leader Qaddafi, al Qaeda was able to set up well armed, well trained, and combat-tested militias. Two militias headed by Wisam Ben Hamid and Hayaka Alla adopted the black flag of al Qaeda, although they advocate fewer animosities against the non-Muslim West, the report said. Currently the secret al Qaeda network in Libya is "in an expansion phase," according to the report, and is operating training camps and media campaigns on Facebook and YouTube. "However, it will likely continue to mask its presence under the umbrella of the Libyan Salafist movement, with which it shares a radical ideology and a general intent to implement sharia in Libya and elsewhere," the report said. The affiliate Al Qaeda in the Maghreb is expected to connect to the central al Qaeda network in Libya as a way to secure its arms supplies for operations in northern Mali and Algeria, the report said. Also, al Qaeda in Libya is expected to use the lack of central government control to train both local and foreign militants who will be dispatched to Syria, where rebel forces are battling the regime of Bashar al-Assad. The central al Qaeda group, currently led by Ayman al-Zawahiri, remains couched in secrecy and has sought to distance itself from regional affiliates in Africa and the Middle East for "security reasons," according to the report. However, the report concludes that Ansar al-Sharia and Qhumu "could be the new face of al Qaeda in Libya despite its leader’s denial." Various militias, called katibas, are operating throughout the country and "are thought to be cooperating with Ansar al-Sharia and probably make up the bulk of al Qaeda’s network in Libya." Numerous jihadists were identified during a gathering held June 7 and 8 in Benghazi of some 15 militia groups that support the imposition of sharia law. Ansar al-Sharia hosted the gathering. The report traced the rise of al Qaeda to the Transitional National Council, the rebel political group that first ruled Libya after the ouster of Qaddafi in 2011. The Council never controlled the rebel movement that was initially led by a former Qaddafi army chief of staff who was assassinated by an Islamist rebel faction thought to be close to al Qaeda. Two radical Islamists—Abdel Hakim Belhaj, who became the military commander of the 20,000-strong Tripoli Military Council, and Ali Sallabi, a Muslim cleric linked to the Muslim Brotherhood—are now the key figures in the new Libyan government. Little is known about the number of al Qaeda terrorists in Libya, according to the report. However, a December 2011 report by CNN revealed that al Qaeda leader Zawahiri dispatched jihadists to Libya, including one leader identified only as "AA," and that more than 200 operatives are in the country. The Pentagon report said "AA" is likely Abd al-Baset Azzouz, a jihadist who lived in Britain until 2006 and who traveled to Afghanistan and Pakistan in 2009. "His selection for the Libyan mission indicates that senior al Qaeda leaders trust him to carry out the strategic task of establishing an al Qaeda network in Libya," the report said. "It is likely that Azzouz will operate in conjunction with other senior al Qaeda operatives in Libya." The CNN report said Azzouz had recruited 200 terrorists in eastern Libya alone. Another key al Qaeda leader in Libya was identified in the report as Abu Anas al Libi, who is "most likely involved in al Qaeda strategic planning and coordination between [al Qaeda senior leaders] and Libyan Islamist militias who adhere to al-Qaeda's ideology." His location remains unknown, and he is wanted for his role in the U.S. Embassy bombings in Africa in 1998. "Abu Anas is well trained in operational security and he is likely co-located with other senior al-Qaeda members in Libya, possibly with Abd al-Baset Azzouz," the report said. This entry was posted in National Security and tagged Al Qaeda, Ansar al-Sharia, Barack Obama, Benghazi, Christopher Stevens, Libya, Middle East, Obama Administration, Pentagon. Bookmark the permalink.